The Rollan Wine Estate is presenting it’s new limited edition wine ‘Collection Or’ in gold decorated bottles packaged in luxury boxes in time for the Christmas gifting season. 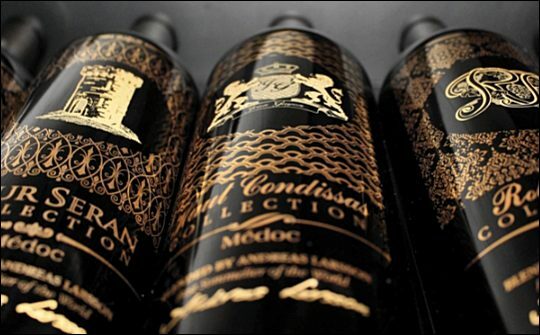 A selection of five blends of wine typical of the northern Médoc terroirs in the Bordeaux region with complexity and elegance have been blended by sommelier Andreas Larsson. The first three blends are Rollan de By Collection 2009, 58% Merlot, 42% Cabernet Franc; Haut Condissas Collection 2009, 95% Merlot, 5% Cabernet Franc; and Tour Seran Collection 20009, 17% Merlot, 82.5% Cabernet Sauvignon, 5% Peit Verdot. The ornately embellished bottles are packaged either in a five-bottle luxury box with each bottle individually wrapped, or in individual ‘prestige’ cartons with transparent window.